High in the Himalayan Mountains lies the small Kingdom of Nepal, with its lofty mountains, deep valleys, lush jungles, exotic wildlife and diverse peoples. Mostly known as the Land of Everest or the Birthplace of the Lord Buddha, Nepal has a variety of attractions to keep tourists coming back for more. Visit Nepal - We welcome you to Nepal, the country which is one of the most exotic destinations of the world with Adventure, Cultural, Pilgrimage & Wildlife Travel Packages. We also offer hotel reservation & hotel holiday packages. 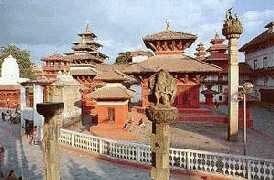 Chandeshwari shrine is located north of the sprawling trading town of Banepa near Dhulikhel. A track leads northeast past the town hospital to the temple on the bank of a forested gorge. The temple is dedicated to Parvati, whom they called upon to slay ?Chand?, the most fearsome of the demons. It thus became known as Chandeshwari, "the slayer of Chand". The main attraction is a remarkable fresco of Bhairav, painted on the western wall of the main structure. The torana and struts of the three-tiered temple are richly carved with the eight Astha Marikas, or "Mother goddesses" and eight Bhairavs. A center of Mahayana Buddhism was established in 1969 by two Lamas; Lama Thupten Zopa Rinpoche & Lama Thupten Yeshe. Since its inception the center has been responsible for introducing thousands to Buddha's teaching through meditation courses, ectures & retreats. Royal Bardia National Park situated in western Terai of Nepal is one of largest undisturbed parks in the region. The park is the home of many endangered animals, reptiles and birds - including the elusive Royal Bengal Tiger. A few years ago, under a successful wildlife project several young one-horned rhinos where translocated here from Royal Chitwan National Park. Over the years, Bardia has also been a good place for tiger viewing - a rare event anywhere. Recently sightings of a group of wild elephants have further enhanced the wildlife experience possible in this beautiful and unspoiled sanctuary. A stay in this park is recommended with the combination of a short raft trip down the Karnali and Bheri rivers or with a trek to Dolpo and the Rara lake area in far western Nepal. The word "Himalaya" is Sanskrit for "abode of snow". This region has an altitude ranging between 4,877 m to 8,848m. It includes eight of the 14 highest summits in the world that exceed an altitude of 8000 m, including the highest of them all, Mt. Everest (8,848 m). Only 8% of Nepal's population live in this region. The region's culture and religion are closely linked to Tibet, and the traditional economy was (and sometimes still is) based on trans-border trade with its northern neighbour. Indeed, the best way to experience Nepal's unbeatable combination of natural beauty and culture riches is to trek through them. One should know that trekking means walking and is a process rather than a destination. As one gets into shape, it's easy to fall into walking-machine mode. Though trekking demands a physical challenge, a trekker should remind himself/ herself to stop at teashops, admire the views, splash in a stream and play with local kids. Walking and nothing, but day after day, provides illuminating insights of Nepal's diversity in terms of geography, people, religion and culture. The main precaution to be taken while trekking is not to go up too high too fast. The body should be given plenty of time to acclimatize. Acute Mountain Sickness (AMS) refers to the effects of the thin air at high altitudes which can be very dangerous and may even result in death. If you get initial symptoms like nausea, dizziness, swelling of the face and breathlessness, descend to the lower elevation immediately and seek medical help. 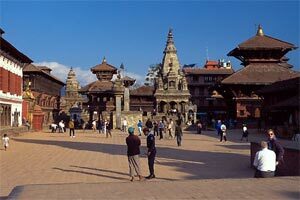 Check out Travel FAQ for more details on trekking in Nepal. The Annapurna Circuit attracts a relatively high number of trekkers in Nepal. As the name itself suggests, this trail goes on a circuitous route around the entire Annapurna massif, visiting the Tibet-like country on the northern slopes of the Himalaya and the dramatic Kali Gandaki gorge. Much of the trek is through lowland country, but there is one high pass, "Thorung La" (5,380m). The trail over the pass is steep but in good shape and not hard to follow. This is the one point of the entire circuit where you really feel you are amidst the mountains. However you should be aware of altitude sickness and be prepared for weather extremes as the Thorung La is notorious for changing its moods. The pass is usually snowbound and un-crossable form mid-December to mid-April. The trek up the Langtang valley is another of those finest mountain treks. Situated directly north of Kathmandu, this region has three relatively short yet interesting treks: Langtang, Helambu and Gosainkund. The regions are usually visited separately but can be combined in as 16-day trip. Lower regions like Helambu are perfect for winter treks and in springtime this region's rhododendrons are especially beautiful.The people are a mixture of Tamang, Sherpa and Bhotia. Food and lodging are easily available along the main routes. Beyond the aforementioned "Big Three" trekking regions of Nepal, Nepal is basically a virgin territory for trekkers. Trekking off the main paths is not only possible, but can be immensely rewarding, though you need a sense of adventure and an increased ability to deal with the unexpected. The treks range from teahouses to wilderness hikes. Frequently they combine both aspects by crossing over one or two uninhabited passes. You need extra time to get beyond the standard routes, however, as said rewards are great - not just mountain views, but increased contact with a wide range of Nepalis, and the chance to glimpse a completely different way of life. Upper Dolpo shelters about 6,000 people, whose lives revolve around Buddhism, barley, and yaks; their villages (over 4,260 meters) are among the highest settlements on earth. A large portion of Dolpo has been set aside as Shey-Phoksumdo National Park, at 3,555 sq.km. The park shelters blue sheep, Himalayan black bear, leopards, wolves and the elusive snow leopard. Largely thanks to "The Snow Leopard" book and Oscar nominated movie, "Caravan," Dolpo is the best known of Nepal's remote northern border regions. 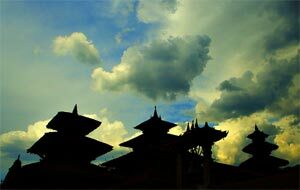 One needs to get trekking permit from Department of Immigration in Kathmandu or Pokhara to visit this fascinating region. Check out travel faq for more information on this. Phoksumdo lake at 3,627m is the most fascinating part of the whole trek in Dolpo. The lake is a basin of unearthly turquoise blue ringed by rocky crags and forest, framed by snowcapped peaks. Rara lake, the largest lake of the country, is a major destination among the treks in western Nepal. The lake, located within the Rara National Park, is perched on a high shelf, encircled by gray ridges and pine forested hills inhabitated by beers, jungle cats and deer. The trail leading to the lake was built as a horse trail for His Majesty King Mahendra's 1964 visit to Rara. Access to Rara Lake is from Jumla, which can be reached by flight or by walking for around ten days from Surkhet in western Nepal. A trip to the lake and back to Jumla takes just about ten days. Kanchanjunga, referred as "Five Great Treasures of the Snows", is the third highest mountain of the world that lies at the eastern border of Nepal at an altitude of 8,586m. It takes at least two weeks' walk to reach the destination, Khangchenjunga base camp. There are two Kanchanjunga base camps - north and south, and the usual trek involves reaching either of them. It is possible to visit these both camps, but it takes a much longer time and moreover both are very difficult to cross. This region requires a trekking permit from Department of Immigration from either Kathmandu or Pokhara. The trekking fee for one person per week for the first four weeks is US$10 and US$ 20 per week thereafter.